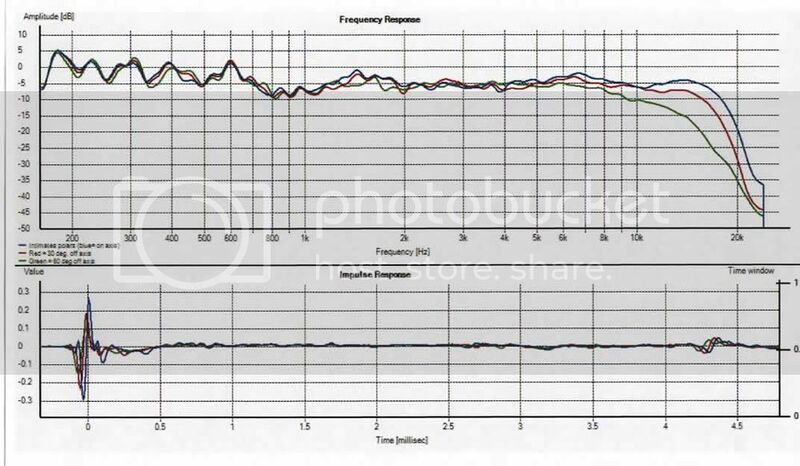 I decided to build (more correctly stated; assemble) two mini-monitors, one with the SFE xo and the other with the AR sxo so I could compare their measurements and sound. Each design resultd in a 1st order elect xo so I knew I needed to find some very good quality drivers that could handle the demands of those xo's. 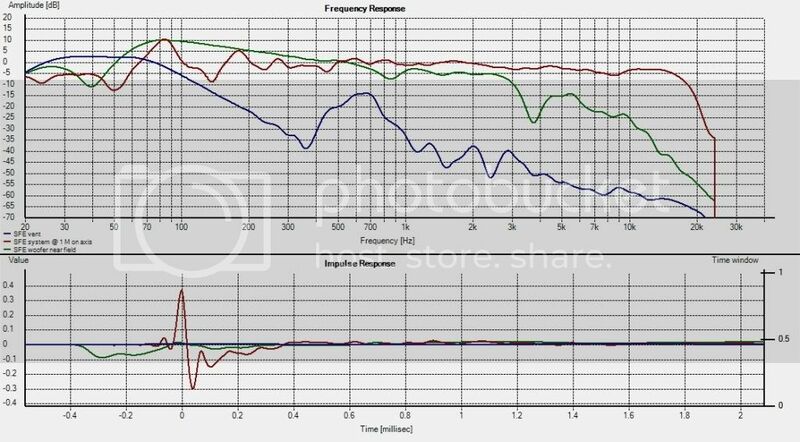 I eventually settled on a SS D2905/970000 tweeter and SS 15W/8530K 01 woofer mid which when coupled with a 1/2 cu. ft. vented box could easily get down to 40 hz. Not wanting to be bothered with constructing boxes, I decided on the attractive PE p/n 302-723 curved sided cherry 'finished' cabinets. The other critical consideration in the driver selection was that each had a relatively smooth extended FR. With the SFE design I still had the problem of dealing with the tweeter's series wired resistor and its power challenges and inherent heat dissipation. Then it hit me. I needed to install a vent (ended up 2" dia. X 9" long PE p/n 260-387). So, locating the resistor near the vent's internal mouth would naturally cool it by the air flow thru the vent. 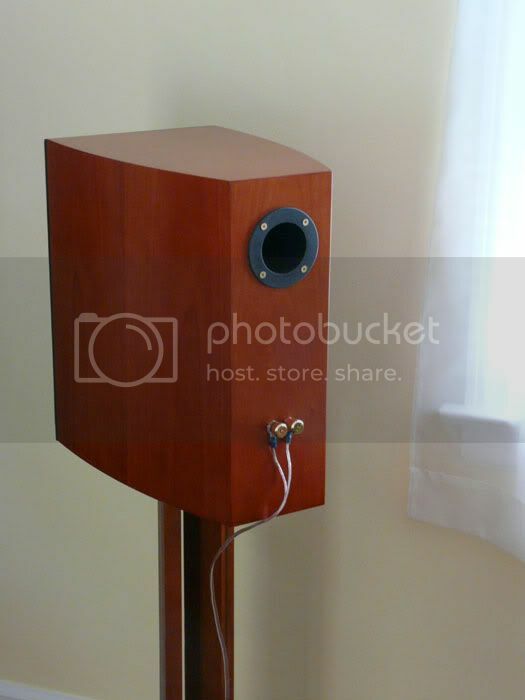 I decided on locating it high up on the back side behind the tweeter and selected Mundorf M-resist 20W resistor. They come with a convenient 1/4 in hole thru their center. I cut some 1/4 inch wood doweling and installed two pre-fabed wooden 'nests' on the inside cabinet sides to rest the dowel in a position that suspended the resitor right over the end of the vent tube. High quality coils were selected. A 3.0 mH, 15 ga. air coil for the woofer/mid and 14 ga. copper foil coils for the tweeter parallel coil. Being concerned about tweeter protection in the event of a DC surge, I decided to add a totally optional high value cap in series with the tweeter and settled on a 500 uF Bennic which didn't impact the already finalized xo topologies. After some extended listening with each xo in my somewhat reverbarent listening room, I decided on the SFE xo with it's small BBC dip response using 15 ohms for the series resistor. If you want a flatter response, you can try a 10 ohm resistor in place of the 15 ohm shown on the schematic. I haven't had much luck with it. Evidently, the 5 ohm reduction in series resistance is just enough to bring on ringing. In the meantime my wife saw the finished speakers and said "your keeping those aren't you?" 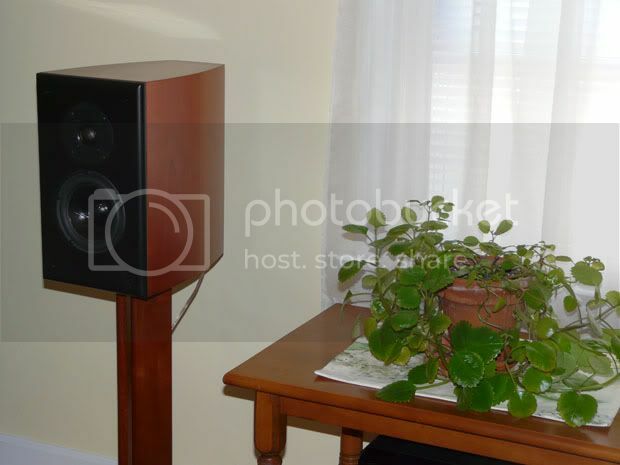 :D So, they now reside in our living room where no speaker system has sat for many years since we first got married and I owned a HK compact stereo. Bass extension with these woofer mids in these vented cabs is surprisingly low and articulate. Reviews from fellow audio society members who've visited for extended listening sessions have been very positive. I decided to call these speakers the Intimates because they aren't designed for regular 95+ dB listening. They perform best with acoustic music and vocals from smaller groups. I have them on 26 inch high solid cherry stands located about 1 ft from the wall to take advantage of the vent's reflected output. Being a hugh fan of classical music, I also listen to symphonies with them as well. They hold their own, but obviously don't have the big, complimentary symphony sound you'd get from a much larger multi-driver speaker system. ADd a xsim model of the above design. I am not narrowing the date yet. Got to do a couple of projects for PE and was hoping to let em rip on next NY/NJ DIY. The weather is going to start getting bad soon, so may be after New Years? Belated congratulations to you for making the PE projects team. I hope things work out for all you guys to your satisfaction and look forward to your creations. Late March, early April so snow isn't a concern? Oh Mike. Very rude of me, but Congratulations! I've been so busy with the work that I spaced. Apologies. commercial. Roman are you narrowing down a date for DIY NY/NJ ? Depending on the date of the DIY event, I might be talked into shipping them to Roman if someone prepaid the cost. However, I've been without them now for quite some time and miss them a lot. So, when they do eventually get back to me, I won't be in a hurry to part with them. are about. Hold onto them Carl until I send you the pre-paid shipping docs. The 'challenge' is an interesting one, but I'll take a pass on making the arduous drive (for me at least) to Brooklyn. Go ahead and build your speakers. I will be interested to see how they measure and fare at your next DIY NY/NJ event. Am I the only DIY'r who's implemented a Mundorf AMT into a TW design?????? no, no. I will build with Satori and Viawave. You already have Intimates with Mundorf AMT and Revelator. Yes, Viawave is the Russian ribbon. which I evidently didn't pay attention to. That schematic is on my old computer, so I'll have to recreate it on my new one and replace the one in error if I ever find the time since NO ONE seems to have built my initial design nor probably ever will. Last edited by carlspeak; 10-12-2015, 09:33 AM. across the tweeter. It is an RL tweeter crossover.